Vaughn Nickerson, Robert Cook, and Anthony Van Horn applied for the 2018 Prize for Teaching Excellence as a team. 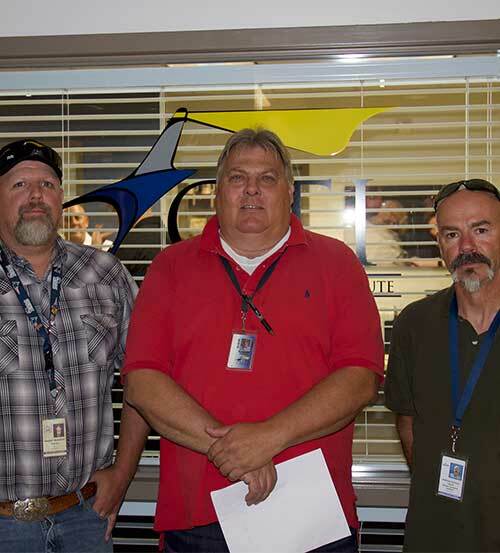 They teach the Construction Youth Mentor Connection (CYMC) program at Granite Technical Institute, which is a magnet technical school for eight high schools in the Granite School District in Salt Lake City, Utah. The program focuses on serving students with significant school credit deficiencies and ensuring they complete high school. Nickerson has been teaching for 17 years and has a contractor’s and residential master electrician’s license. Cook has been teaching at Granite for 20 years and has a master plumber’s license. Van Horn joined the school 3 years ago after obtaining his contractor’s license. In addition to providing support and mentorship for their students, all three teachers have adjunct status at Salt Lake Community College and offer concurrent enrollment courses for college credit. Students in the CYMC program begin with a construction trades foundation and construction technology class. Students then have an opportunity to explore different aspects of the industry, including differences between residential and commercial construction. This conversation continues as students move to more focused training in carpentry, plumbing and electrical. Students in electrical classes have an opportunity to wire multiple houses and are also trained in renewable energy through solar installations. Exploration is conducted on the construction and homebuilding training sites, and also on sites of other districts in the area. The Granite Construction Training Program and CYMC are designed to support seamless transition to further training and/or employment. Students are signed up for employment coaching and placement, academic credit recovery, and skilled trades instruction in one comprehensive program. Students develop relationships with postsecondary and industry partners starting in the first classes they take. Students learn to have conversations with human resources personnel and heads of companies. Internship opportunities allow the student to assess the work environment of a company while the employer asses the work ethic of the student. Both the student and company have the ability to determine if the job is a good fit. Students leave the CYMC program knowing people from both the postsecondary and industry sector. 85% of students — who were formerly severely credit deficient — graduate and walk with their class. A celebration is held at the end of the school year honoring students for completion of high school requirements for graduation and the industry skills they have developed. Companies are invited to the celebration and students have a chance to talk with the companies about employment. Every student attending the 2017 celebration had multiple job offers from companies before they left.